Working in public relations, community outreach programs are both my beloved and hated assignments. I love watching programs succeed when companies improve the community while using its new image to attract customers. But I hate the cynical community who believes the outreach programs are distractions from company scandals or attempts to greedily attract new customers. Pumpkin Scissors takes an animated look at public relations on a military scale as the protagonists engage in a community outreach program that garners the most cynicism: War relief. Pumpkin Scissors depicts a fictional European country three years after a great war that bears some resemblance to the actual Great War. Cities and civilians are struggle through postwar casualties, famine, and poverty. 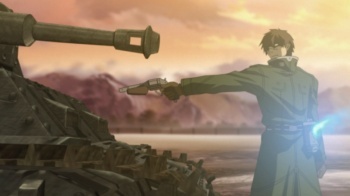 The anime begins with a solid concept that explores the process of war relief. Known as the Pumpkin Scissors, the skeleton crew of Section 3 aids refugees, eliminates the corruption of war profiteers, and restores faith in the military and government. Optimistic Pumpkin Scissors members are constantly showing how "war is hell" as they see first hand the aftermath of war as they attempt to restore the status quo. The job is thankless since the citizens are cynical towards military relief since it was the military that made them victims during the war in the first place. Corruption and violence do not help things much either. Characters in the Pumpkin Scissors are the basic templates of team anime consisting of a driven leader, a womanizer, a well-mannered guy, a ditz, a patronizing chief, a peace seeking war vet, and a dog. The female protagonist Alice stands out as she juggles believing in the war relief effort her military is performing, witnessing first hand the plight of the civilians, and maintaining the pride and honor of her noble family. It is a pity the other characters are not as well developed. Production values are above average. The post-WWI setting paints tragically beautiful scenes as bombed out buildings clash with the otherwise picturesque cityscape and the poor peasants are dirt compared to the crisp uniforms of the military or the fancy dresses of nobility. Tanks make a formidable presence to reflect the fear they brought on the battlefield even if the CG effects do not integrate so well with the animation. Action scenes are occasional and fit within the limited technology of its setting. The English dub is a little spastic with liberal doses of exaggerated German accents. Music is pretty good to match the war mood but the cutesy ending themes are strangely out of place. Pumpkin Scissors is primarily an episodic series showing the titular military section performing various feats of war relief like delivering medical supplies or setting up soup kitchens. To break the monotony, the series attempts to form a connecting story through the unveiling of conspiracies. This becomes a problem since the series will pick up a conspiracy, develop it a little, then abandon it in favor of a new one. The main conspiracy regarding the the Invisible Nine illegal super soldier research project featured on the DVD packaging is a large letdown. Pumpkin Scissors was not sure whether to use the Invisible Nine as a series of difficult villains for the protagonists to defeat through cool action sequences or as a platform to explore the ethics of illegal war research intended to reduce wartime casualties at the cost of a few human test subjects. As Pumpkin Scissors sampled both avenues before deciding, the government apparently killed the writers working on the Invisible Nine arc and forced the anime studio to sweep the concept underneath additional filler episodes. The finale is a chaotic free for all where peasants, nobles, politicians, foreign mercenaries, the Pumpkin Scissors, and its rival military section with its legion of shock troops are all about to cause a civil war over class, honor, corruption, and martial law. The circumstances that caused such resentment over each other were never fully developed during Pumpkin Scissors so the climax feels forced, rushed, and fake. There is also a secret organization who teases itself as the threat of the possible second season of Pumpkin Scissors that seems to be behind all the postwar corruption, but just mentioning it hurts my brain. Had Pumpkin Scissors focused on fully developing at least one aspect of the story, it might have been a good series. As it stands, it feels unfinished with only a few interesting bits to spare from being totally forgettable. Bottom Line: Pumpkin Scissors features a promising postwar concept and great potential, but it spreads itself too thinly resulting in scattered underdeveloped mess. Recommendation: It is not worth digging through 24 episodes of Pumpkin Scissors to find the occasional anime gem lurking inside. Skip it. Tom Tonthat admits that despite how impractical it is as a gun, he still wants Corporal Randel's Door Knocker pistol.